After you have completed work in the casings you'll need to put the motor back together again. Have a look at the inside of the flywheel casing. The larger of the two bearings is the end bearing for the solid gear cluster or "X-mas tree". Fit the end of it in to the bearing. Rub a little transmission oil on the shaft before setting the flywheel side casing to one side. 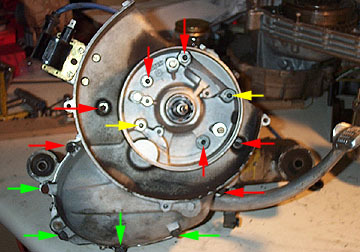 The motor above has a two pice flywheel side bearing so it is not necessary to heat the flywheel side casing. 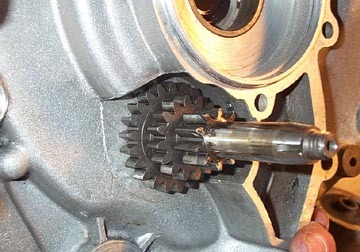 If your motor has a single piece flywheel side bearing you will need to carefully heat up the casing around where the flywheel bearing will sit. Make sure all the inside parts of the casings are ready to go and there are no remaining bits on your workbench. Lightly smear a little grease on the gasket face of the clutch side of the casing and then lay a new main gasket over it. The grease helps to hold it in place. Put a little grease on the lip of the flywheel side bearing. Now carefully lower the flywheel side casing down on to the clutch side. The X-mas tree shaft should go down the center of the clutch basket. 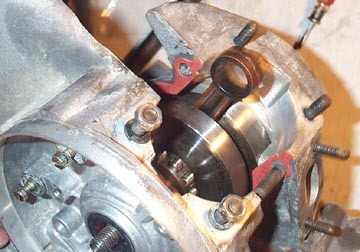 Be careful to make sure the lip on the flywheel side oils seal doesn't ride up on the crank taper as it pushes through. The small frame bike has a series of 11mm casing nuts around the perimeter. Most of these pass through the casings and have special D shaped bolt heads so they don't rotate when tightened. The red arrows above show casing bolts with their thread facing towards you, the green arrows show bolts where the thread & nut are located on the other side of the casing, and the yellow arrows show studs that are set into the casing itself. Tighten them all evenly while checking to make sure the motor internals still rotate freely.